New Toronto lies to the immediate west of Mimico. It is located along the water’s edge stretching from Dwight Avenue, near McDonald's Restaurant, in the east to 22nd/23rd Street in the west. It runs from the shores of Lake Ontario north to the railway tracks. Physically the smallest of the South Etobicoke communities, it was established later than Mimico and Long Branch. At its founding, it was one of Canada’s first planned industrial communities. It was essentially a planned community from the beginning in response to the construction of the electric Toronto Radial Streetcar Line in 1891 which was the catalyst for the development of the community. In 1904 the Grand Trunk Railway moved its maintenance yards to New Toronto bringing large numbers of workers and their families. Then in 1906 Canada’s first slab concrete highway was built along the Lakeshore Road. This enabled commuters to easily travel to work and it also caused a flurry of homebuilding in the community as more and more travellers became familiar with the area. In 1916 Goodyear built a sizeable tire factory in the heart of New Toronto in response to the demand for war materiel. A housing boom ensued to provide much-needed accommodation for workers and management. The village continued its rapid growth through the years of the Second World War as the need for war materiel increased dramatically. Today most of the industries, except for Campbell Soup, have vanished. Today New Toronto is a very desirable residential community in which to live. New Toronto appeals to residents for several reasons. First it is a completely self-contained community with its own swimming pool, tennis courts, outdoor hockey rink, skating trail, baseball diamond, library, junior public school, junior separate school, several daycare centres, churches and even its own lawn bowling green! There is good ol' fashioned street shopping all along Lakeshore Boulevard including 2 major drug stores, a supermarket, great ethnic restaurants, a fabulous Portuguese bakery and MacDonald's. And let’s not forget Tatsu’s, the best all-natural bakery in the West and Sweet Olenka’s, the yummiest chocolate shop ever! 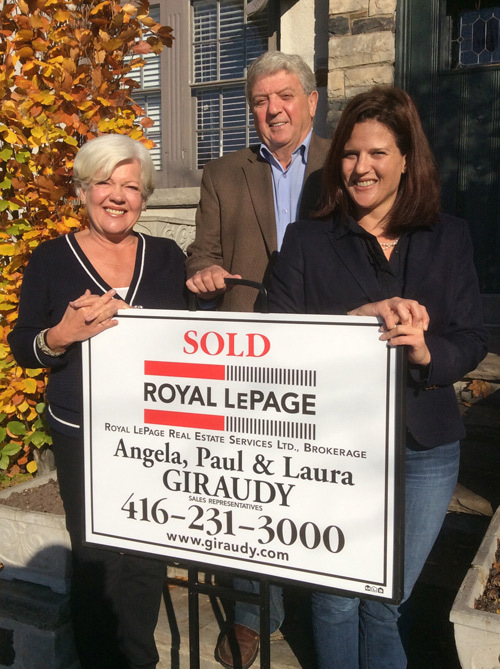 For these reasons, we as professional Realtors, promote New Toronto as a community with that “small town-in-the-city feel”. The local Business Improvement Association (BIA) is currently marketing the community with the name "Lakeshore Village". Visitors may notice advertising and signage to this effect. New Toronto is also conveniently close to Humber College Lakeshore Campus, Lakeshore Yacht Club and the MasterCard Centre for Hockey Excellence where the Leafs and Marlies practice. 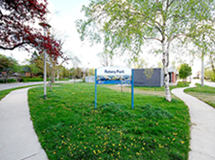 Plus this great little community fronts onto the lake and local lakeside parks such as Prince of Wales Park, Cliff Lumsdon Park and Rotary Peace Park. Best of all the Heritage Waterfront Trail runs right through the community and it is but a few short blocks to a vast lakeside park—Colonel Sam Smith Park—with miles of hiking/biking trails, acres of green space, real beaches, wetlands, a picturesque skating trail and sailing club! New Toronto is served by several public schools including Seventh Street Junior, Second Street Junior-Middle, Lakeshore Collegiate and the Etobicoke School for the Arts. French Immersion is provided at John English and also at Sir Adam Beck in Alderwood. Separate schools include St Teresa's Junior-Middle on Eleventh Street and the new Father John Redmond Catholic Secondary School and Regional Arts Centre which is located in the grounds of the former Lakeshore Hospital next to Humber College. 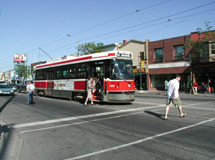 New Toronto is connected to downtown by the Lakeshore/Queen streetcar and to the Bloor subway via the Islington and Kipling bus. Ease of access to highways and public transport is a major feature of this community. In terms of housing stock, most of the properties here are 2-bedroom and 3-bedroom detached homes with a sprinkling of semi-detached. These homes were built from the early part of the 20th Century through the 1920’s and 1930’s. As with Olde Mimico, New Toronto appeals to people who love good ol' fashioned charm and character homes with loads of wood trim, hardwood floors, fireplaces, verandas and brick exteriors. Today there is currently a popular trend amongst young families of topping up bungalows to create larger 3 and 4-bedroom family homes in this much-sought-after community. There are 160 townhomes in the community located on the north side of Lakeshore Boulevard between 9th and 13th Streets in a newer development known as the Residences of New Toronto. 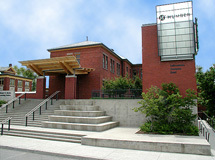 These attractive, trendy units were built in 2003-2004. Essentially, New Toronto is a very affordable, family-friendly and intimate community that particularly appeals to singles and young couples looking to start a household.